In large bowl, beat butter with electric mixer on medium speed until creamy. Add cake mix, pudding mix, 1/2 cup milk and the eggs; beat on medium-high speed until blended. Using 1 1/2-inch scoop, drop slightly mounded scoops of dough about 1 inch apart onto cookie sheet. Bake 10 to 12 minutes until set (do not overbake). Cool 2 minutes; remove from cookie sheet to cooling rack. Cool completely, about 20 minutes. In medium bowl, mix filling ingredients until well blended. For each pie, spread about 1 tablespoon filling on bottom of 1 cooled cookie. Top with second cookie, bottom side down; gently press cookies together. In small bowl, mix powdered sugar and 4 teaspoons milk with spoon until smooth. 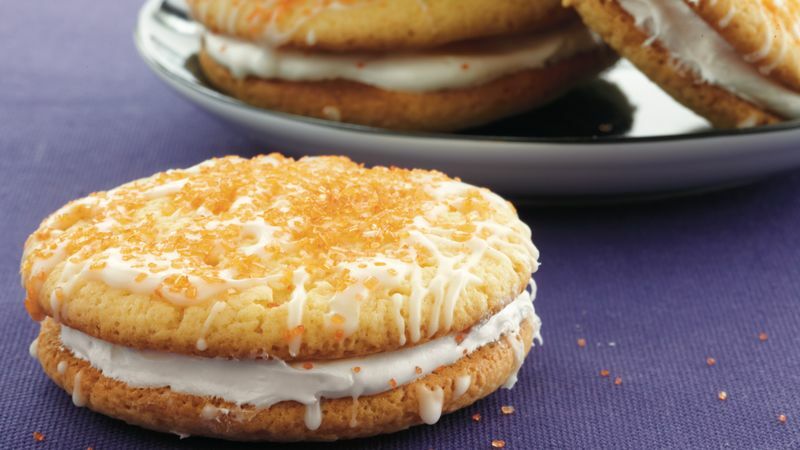 Drizzle icing over sandwich cookies. Sprinkle with edible glitter. Use your favorite colors of edible glitter as the seasons change.